This is a sacred place of undines (water spirits) where the River Treillet near Tintagel in Cornwall drops in a 60 foot (18m) waterfall into a calm basin pool. 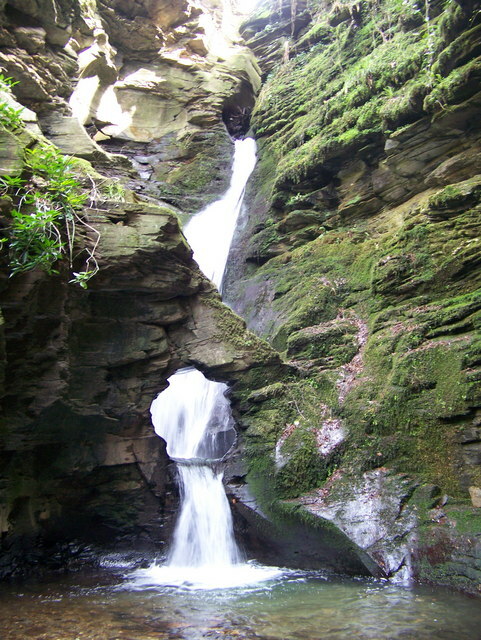 St Nectan’s Glen or Kieve has unsurprisingly become a place of pilgrimage with copious devotions left to honour the spirit of the place. St Nectan was a 6th century Welsh saint, a hermit, the son of St Brychan, who may have had a dwelling at the top of the waterfall. It is thought he made his home further north in the Hartland area of Devon. The recorded name of this site first appeared in 1799 as Nathan’s Cave. There is a building at the top of the waterfall and under new ownership from 2012 a new woodland walkway allows visitors to view the waterfall from above. There is a lovely wooded walk beside the river up to the Glen. Undoubtedly it is one of those special places where words cannot convey the atmosphere created by the special geology to be found here as the water falls and plays and cascades through the rocks. Lionel Fanthorpe wrote about the mystery of St Nectan’s Glen in ‘The World’s Most Mysterious Places’ (Harlow Press). Directions: Drive from Tintagel to Boscastle (and vice versa) on the coast road (B3263). Park in the free car park situated just off the road in Trethevy. Follow the signs on foot.